Jennifer Marsden’s Knights of the Rose is new musical with a score that belts out so many familiar power ballads that it’s often hard to keep track of the actual storyline. 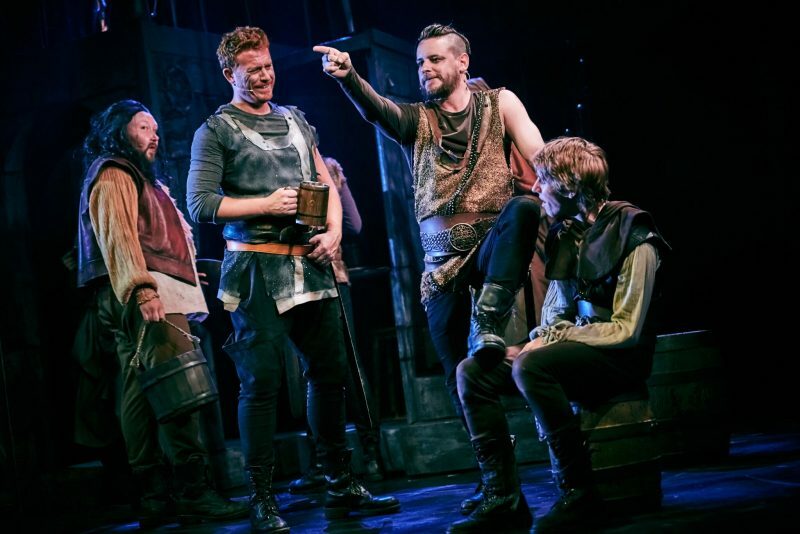 With a cast that handle these numbers effortlessly and a book that often felt like it been written for the sole purpose of allowing the actors to show off their vocal skills, Knights of the Rose entertains but not for the reasons intended. This extremely talented, all-white cast builds the world of England’s Middle Ages in a lovely way, with the narrator John (played by the brilliant Ruben Van Keer), a young knight in training, offering up poetic storytelling and at times relaying important exposition to move the story along. The plot is not uncommon for a show like this one, with clear heroes and villains determined from the get-go. And while most of the popular hits that come frequently and sometimes unnecessarily are good, the show ends up taking on a farcical, almost pantomime-like nature that feels very unintentional. The issue is that this show, under the guidance of director and choreographer Racky Plews, missed the most obvious angle it should have taken. It becomes clear after a few numbers that the audience will never fully accept the well-known songs as a storytelling device, as with each pivotal moment that builds up to one of these songs (a perfect example of this is the use of Enrique Iglesias’s Hero), the audience would burst out laughing as soon as the song becomes recognisable – taking away from the tension and skill that the actors worked so hard to build. It becomes evident that the audience wants the actors to take themselves less seriously and enjoy the fun of these pop tunes in a show that needs to accept itself as comedic. The most obvious moments should use humour and silliness to entertain, rather than taking the chance for another power ballad to be sung dramatically. While this show is definitely entertaining and boasts a fantastic cast and band, it needs to take a breath and lighten up so as to embrace the cheesiness that it so obviously contains. If this were the case, the lovely, dramatic moments, particularly the wonderfully choreographed fight scenes, would be that much more exciting to watch. Knights of the Rose runs through 26 August.